I was fearing switching all my Renard gear to DMX this year because I thought it would take a while, and I might need to debug things for a while so I put it off until setup day, today. I had no reason to fear the switch! I compiled the PIC16F688 Renard DMX asm code into a hex file, loaded it onto my PICkit2 in “Programmer to go” and used my 3M ChipClip. Those things combined made for complete awesomeness. 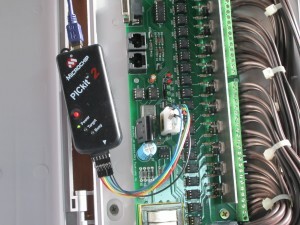 Programmer To Go is a mode supported by the PICkit2 (and likely other Microchip programmers/debuggers). In a nutshell, in the PICkit software you flash the hex file to the PICkit2 itself and then you only need to provide power to the programmer and press the red button to flash µCs. It will then power and flash the target chip. It will blink the yellow light twice to indicate the device is in “programmer to go” mode and it will immediately forget those settings once you connect to the PICkit2 again using MPLAB or the PICkit2 software itself. The 3M ChipClip is a spring-loaded clip that resembles a clothespin, but with .1″ contacts for clipping to standard DIP packaging. It has pin connectors on the top so you can run jumper wires to a programmer, breadboard, etc. I have them hooked up to pins, and the PICkit2 in the proper pin-out for programming. Chip Clips are available from mouser here. Note that the pin-out for programming a PIC16F688 is the same as a PIC12F675 and likely many other PIC products. The two PICs I mentioned are the ones in use for my display. 2 of the PIC12F675s for the strobe randomization, and many 16F688s for the Renard controllers. In case you’re wondering, with most of the Renard hardware at DIYC, you don’t even need to remove the PIC from the circuit, you can simply program them on board. Don’t power the board, simply plug the PICkit into USB for power, put the clip on the PIC and press the button. Today I updated all of the PICs on a Renard 64XC, one Renard 24 v3.3, one Renard SS24, a Renard SS8, and one Renard 24 HC (very similar to the v3.3). All of these worked in-circuit very quickly and easily. Within about 5 minutes I had all of my hardware switched from Renard to DMX! 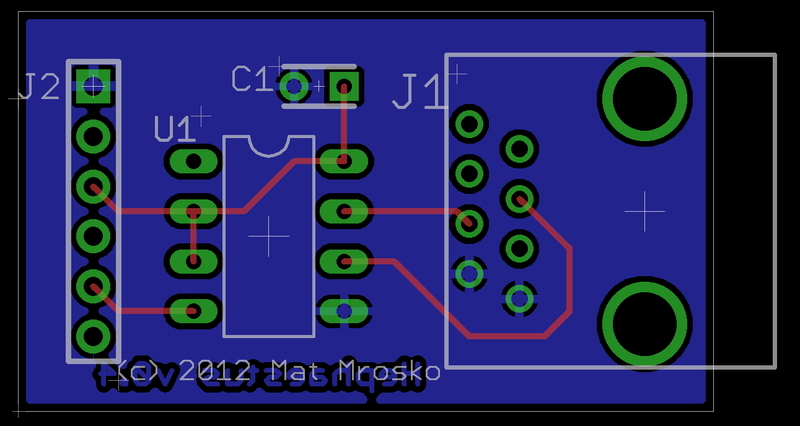 Well after a handful of suggestions from Mike and the DIYC community, I have re-spun the PCB without resistors and without a top plane and a couple other changes. All traces are on top without using a polygon for a power plane. Bottom is not cut by any traces (other than the version text) since all traces are on top. No 45° angles coming off non-round pads for under-etching. Trace from U1-8 to decoupling C1 is very short. 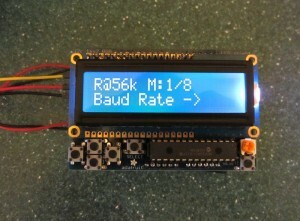 Removed resistors and reduced size after testing breadboard reliability without resistors. Version 0.2 has been made. 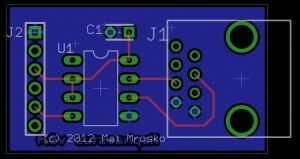 For good design practice, my friend Mike Lane suggested I get the decoupling cap as close to the power pins as possible. He suggested a 90° clockwise turn of U1 and moving C1 below to be near the power pins to increase the effectiveness of the capacitor. Here’s the result to be reviewed. 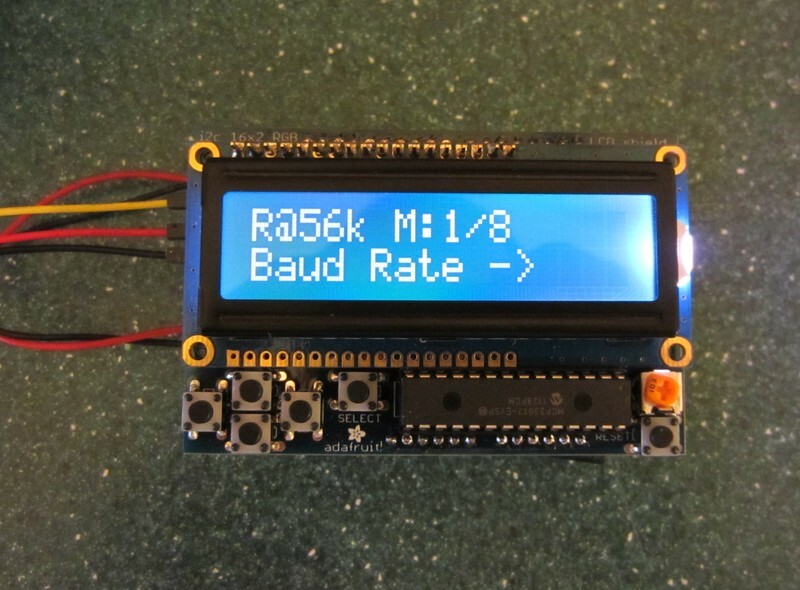 I’ve been wanting to create a stand-alone Renard/DMX tester for quite a while and I finally made time for it. I have made a page for the progress and will post updates to the blog, the page itself, as well as github.